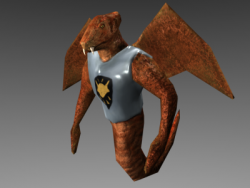 A Wyvern made for OpenDungeons in Blender format. Base model created by Andrew Buck, I modelled the high poly in Sculptris and textured it. The model is rigged, but has only 2 basic animations. 712 triangles. Works great i put it in one of my dev games awhile back.